The OVE grew out of the Danish anti nuclear grassroot movement in February 1975. On the OOA nationwide meeting at Katrinedal Vandrerhjem near Bryrup, Jutland, it became evident, that a new organisation working for alternatives to nuclear power was needed. This idea was strongly advocated by Lars Albertsen, who also proposed a new Danish word: "Vedvarende Energi" (Sustainable Energy) as it was emphasized, that a positive word for the alternatives to nuclear was needed. OVE was important in creating a network between groups of selfbuilders all ower the country, arranging wind meetings, the so called "Vind Træf"s, and lobbying for renewables in the political environment in Copenhagen. 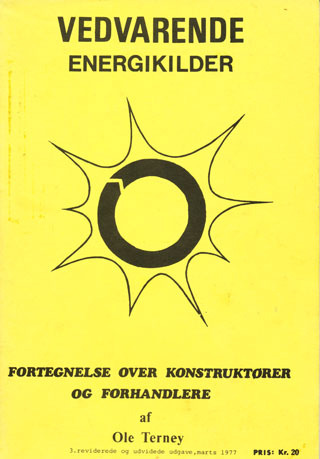 One of the earlier OOA activist Ole Terney kickstarted the OVE work in fall 1975 - by collecting adresses of selfbuilders, constructors and other people working with, or interested in Sustainable Energy, and collecting all this in the first 33 page handbook "Vedvarende Energikilder - Fortegnelse over kontruktører og forhandlere". The second and much more comprehensive handbook - was also collected by Ole Terney, and was issued in march 1977. The third list of Constructors and Dealers. 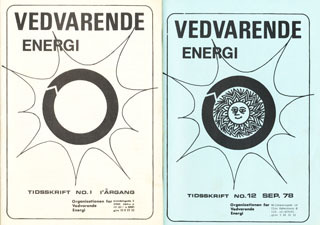 On April 11th 1976 the first issue of the OVE Magazine "Vedvarende Energi" was published. See examples of the magazine content in Slideshow. 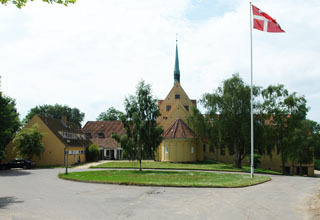 The early "VIND TRÆF"'s were important meeting places for the Grass Root network. Technical details, tests and trials were openly discussed.These meetings were organized by OVE in the earlier years. From 1978 they were organized by OVE and Danske Vindkraftværker in companion. 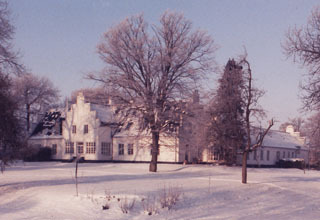 In the nineties, when Vind Træf's were dominated by owners and owner cooperations, the owners organisation DV took over, and OVE played a minor role. First edition of "Vedvarende Energi - Fortegnelse over konstruktører og forhandlere" By Ole Terney. 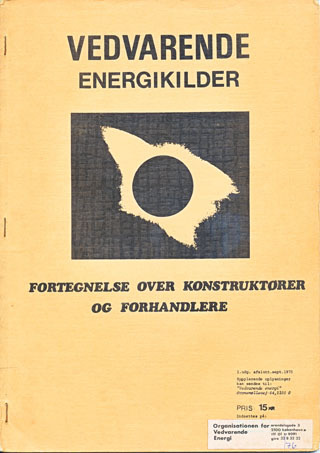 First edition of the Magazine "Vedvarende Energi"
3rd edition of "Vedvarende Energi - Fortegnelse over konstruktører og forhandlere" By Ole Terney. 4th VIND TRÆF -The Wind Turbine Safety Group formed. Energi peoples gathering in open space. 5th VIND TRÆF - Report from W T Safety Group - Presentation of the future RISØ Wind Test Station. Edition of the Safety Flyer from the Wind Turbine Safety Group: "Sikkerhedsregler for mindre vindmøller"
One of the early central persons in the OVE was Lars Albertsen, who was also participating in the OOA nationwide meeting at Bryrup in February 1975. Lars was back then advocating for the creation of a new organisation working for alternatives to nuclear power. OVE was this new initiative. In 1978 OVE changed structure and became an organisation with membership and a chairman. Preben Maegaard was elected the first chairman from 1978 through 1984. Brandbjerg Folk Highschool - "Vind Træf" No. 1. 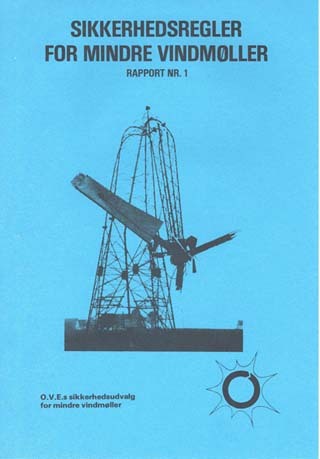 1978 The OVE group for Wind Turbine Safety was created at the VINDTRÆF at Snoghøj Folke Højskole on February 25th 1978. At the early VINDTRÆF meetings, self builders told about failures and run away's of their turbines. It was clear to us, that we had to establish rules of safety for new turbines, in order to avoid catastrophes. No public authority was able to deal with this in 1978. The emerging wind community had to act by itself. Members were : Dorte Arp, Erik Grove-Nielsen, Johannes Grove-Nielsen, Ian Jordan, Preben Maegaard, Henrik Stiesdal, Anders P. A. Tougård, Askel Krogh. The final blue report was released in June 1979. When a powerfull Wind Power industry was established in the eighties, the importance of the organisation OVE deminished, and the Turbine Owners organisation DV became the main player in the Danish Wind Scene.